1) Main and Me is for local…period. 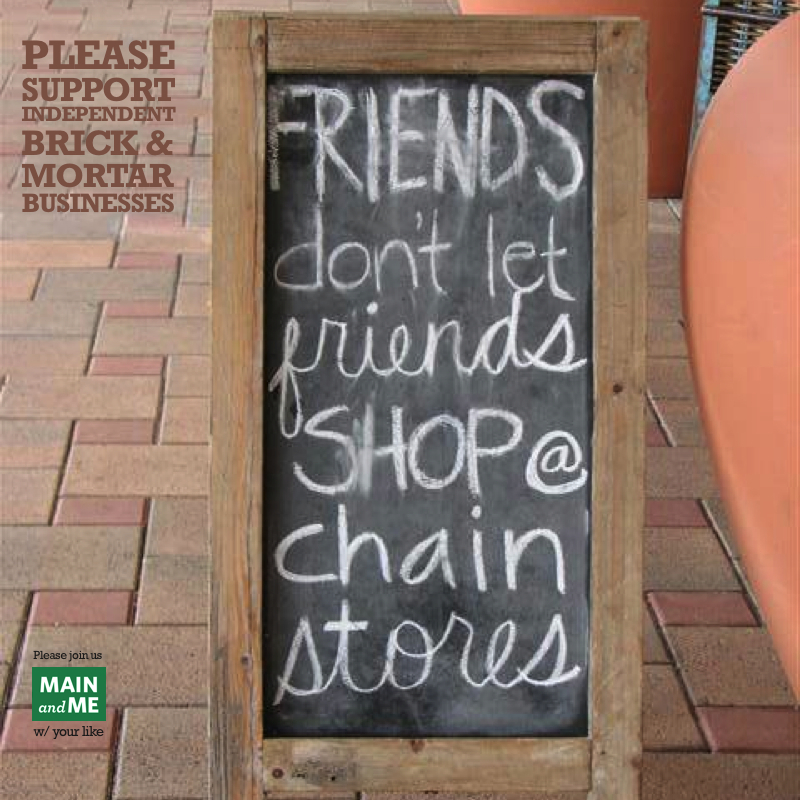 Main and Me is–and always will be–100% dedicated to the support of local, independent business. Whereas Pinterest helps shoppers organize and curate the visual web at large–including products from “non-local” Amazon, Target, etc–Main and Me is exclusively for windowshopping what’s for sale in the independent brick and mortar stores around you, as made visible by the photos uploaded by merchants, shoppers and executive directors who are passionate about supporting their local economies. 2) Your Main Street…windowshop-able online. Whereas Pinterest and Facebook pages can be like lonely islands, Main and Me places individual storefronts in the context of a Main Street page for your city, town or neighborhood, so shoppers (or tourists planning trips?) can windowshop your town visually online, then “drill down” into any individual storefront on your community page. It’s the same way people windowshop along your “actual” Main Street. Shoppers can either serendipitously browse what’s for sale in every storefront, or use our search feature to find specific items. The big idea is that you–the merchants who make up your Main Street–are stronger when you act together rather than separately. Some community directories require “herding cats” to come to a consensus to use. Main and Me leaves the choice to participate to the individual. And because it’s free, there’s nothing to lose and everything to gain by trying. 3) Main and Me networks are user-generated, so ANYONE–be they shopper, merchant, local director, student group, “Ladies Night Out group” or cash mob–can kickstart the process by uploading a single photo from a store. 4) Main and Me gives back to your community. Following beta, our e-commerce phase will kick in and shoppers will be able to purchase items directly from the site. A percentage of any profit will be returned to the local community network. Our primary goal in giving back is to demonstrate our ongoing commitment and support for vibrant local economies. 5) 100% local-supportive wish lists and registries. 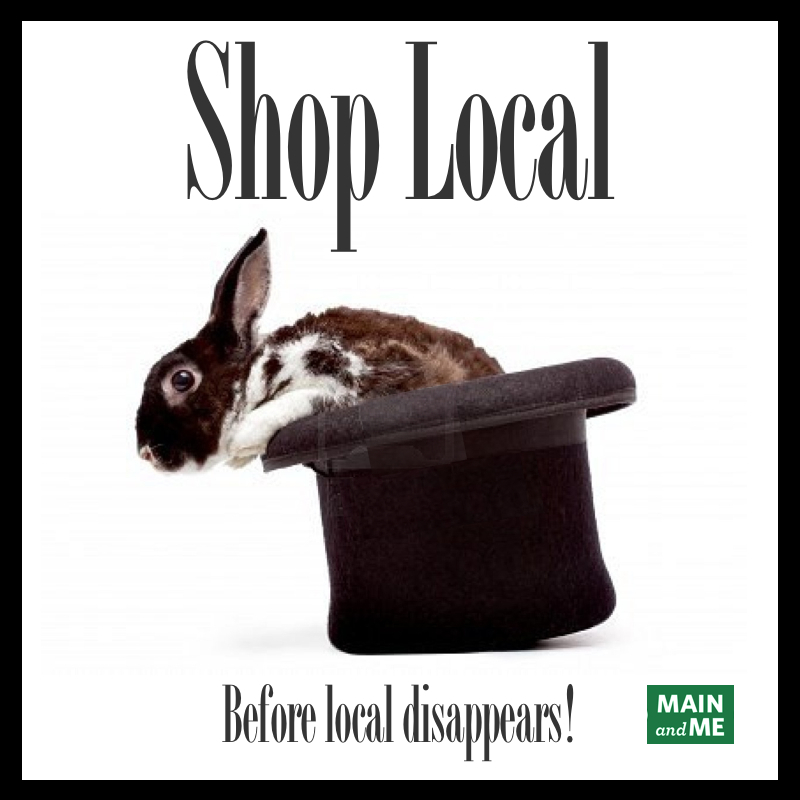 Because Main and Me features only local products and services, the wish lists and registries that shoppers share on Main and Me are always 100% supportive of local independent businesses like yours. 6) Main and Me levels the playing field on which local shops compete with malls, big box stores and Big Internet Retail. Many local shops carry national brands that may be found cheaper online. Main and Me helps those stores become more easily discovered by online shoppers who a) want items immediately, b) who enjoy local personal service and return policies, and c) who appreciate that a percentage will be returned to their local community network. The fact that Main and Me makes what’s for sale behind the brick and mortar facades of your Main Street visible in a Pinterest-like way allows these online shoppers to more easily shift some of their shopping back to local sources. 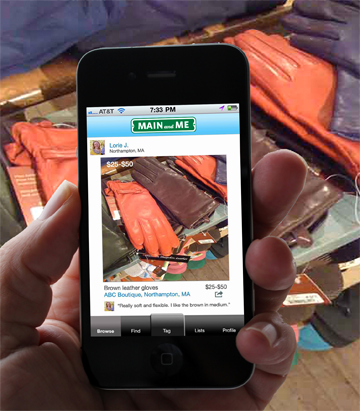 7) Stores, towns and even shoppers can be followed on Main and Me. Shoppers who follow stores, towns or other shoppers on Main and Me can opt in to be notified when that store, town or shopper has added new items to their pages, insuring that they are always kept up to date as to what’s new or exciting. 8) Local windowshopping…from your smartphone. Because Main and Me is a location-based social/mobile network, the Main and Me app (pending iTunes approval) will allow mobile shoppers to discover what’s for sale in the brick and mortar stores around them…wherever they are, whenever they shop. 9) Do both! If you have time, do Main and Me and Pinterest. Though most merchants are stressed for time, they should use every channel they can to reach new markets. At the very least, share the same photos you publish to Pinterest on Main and Me (or vice versa). That way you’ll get the benefit of reaching Pinterest’s audience, while making sure any motivated shoppers are directed back to your Main and Me storefront to help support your network and a vibrant local economy. As always, please call us directly at 413-250-8800 with questions. And now back to your regularly scheduled show. Main and Me …free online wish listing and windowshopping for your city, town or neighborhood…and every LOCAL, independent business in it.